A new rail service from the North East to London has been delayed for several months, it has been revealed. Grand Central is to run trains between Sunderland and London three times a day on the East Coast mainline, with stops in Teesside and North Yorkshire. It had hoped to begin operating on 10 December, but has been unable to obtain rolling stock in time. The service will now start on 20 May, according to the firm's managing director Ian Yeowart. In March, Grand Central fought off a legal challenge from rival operator GNER, which currently runs trains on the east coast. The company will launch the service with refurbished 125mph trains, but new 140mph replacements are expected to be drafted in by 2009. Mr Yeowart said: "These are not brand new trains, but they will be completely refurbished and will come out as new. "We're in negotiations with a rolling stock leasing company about brand new trains, but these take three or four years to deliver. "The important thing is that these will be as good as anything currently running on the East Coast Mainline." The firm is in negotiations with Network Rail, which owns and operates Britain's rail infrastructure, to add a fourth train to the route. Mr Yeowart said he hoped to expand the service to six trains over the next three to four years. 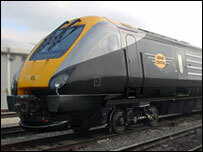 Clear track ahead for new train firm?